The Little House of Concrete Bookshelves: Garry Disher "Bitter Wash Road"
Garry Disher "Bitter Wash Road"
With Wyatt seemingly taking time out to recuperate and plan his next job and Hal Challis and Ellen Destry on hiatus it’s good to know Garry Disher is still churning out quality fiction. I’ve tended to stick to a series once I find one I like, and both the above mentioned are right up there with the best of them, but based on what I read here I was straight out chasing other titles. I couldn’t find Play Abandoned in iBooks or Kindle, so it’s off to the Libraries to chase them up, but Two-way Cut has duly been downloaded and added to the Read These list. The problem, based on the Bitter Wash Road experience, is that I’m likely to sit down to it one afternoon, have it finished before I go to bed that night and be up in the morning looking for another helping of tautly written, immaculately plotted quality crime fiction. Set in the isolated South Australian wheat belt, an hour or so north of Clare, Bitter Wash Road runs with a fairly limited focus through the eyes of Constable Paul “Hirsch” Hirschhausen, a former Adelaide detective who has been returned to the uniformed branch and exiled to a one-man police station in the middle of nowhere in the wake of a corruption scandal. He’s a city cop pushed into a country lifestyle where his colleagues have their own way of running things and regard him, thanks to his involvement n the corruption case, as a whistleblower, dog, and maggot. As things turn out, rather than being a whistleblower committed to justice Hirsch is a decent bloke who has chosen not to do the wrong thing, been caught on the edge of the investigation, which is ongoing through the plot line and adds a further degree of tension, and is being made to pay in much the same way as he would have been if he’d turned the wrongdoers in himself. That’s a distinction his small town colleagues aren’t inclined to make, so things work out the same regardless of whether he actually blew the whistle. Three hours north of Adelaide, Tiverton is a town south of the Flinders Range that’s doing it tough. Forty kilometres closer to the capital, Redruth is slightly larger and boasts a three man one woman police operation with Hirsch’s boss Sergeant Kropp and his male offsiders having carved themselves a nice comfortable niche, going about what they see as their duty with the casual arrogance of people who know and get on with everyone who matters. Or rather, they won’t, if they know what’s good for them. It’s a community of haves and have nots, and if you’re one of the latter you don’t want a ticket for speeding, driving under the influence or (believe it or not) jaywalking. At the start of the story, Hirsch is despatched to investigate gunshots that have been heard just out of Tiverton. He finds the culprits in the shape of a couple of bored kids taking potshots at jam tins with a .22, and is then redirected to the scene of what appears to be a hit and run on a back country road. Teenager Melia Donovan is the victim, and as far as his colleagues are concerned it’s a clear case with an obvious explanation and enough time elapsed to make it impossible to track down a culprit. Hirsch, however, digs around, comes up with question marks, but is frustrated by the way crime scenes and associated evidence have been treated. It’s much the same story when Alison Latimer, who has recently left her abusive husband and is seeking a divorce is found dead, in a location she detested in an apparent suicide. Hirsch has his doubts, but before he can do anything the scene, and her estranged husband’s homestead are rendered useless for anything approaching accurate forensic science. But there’s enough there to keep Hirsch sniffing away, regardless of the hostility surrounding him, and he ongoing corruption investigation, with the internal investigations crowd determined to pin something on him and any number of disgruntled colleagues who’d be only too happy to assist in the attempt. And, in the background, there are ongoing concerns regarding the overwrought media coverage of a couple of thrill killers roaming the outback in a black Chrysler station wagon. As the narrative unfolds what looks on the surface like an exercise in low level small town corruption turns into an investigation with implications considerably higher up the pecking order and the picture becomes increasingly disturbing as the layers are peeled back. 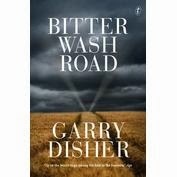 Disher is a class act, and his books invariably exhibit strong plot lines, a diverse cast of characters who are rarely what they seem and enough twists and turns to keep the reader turning the pages. Which, of course, is why I finished this one so quickly, and why I was out earlier this morning looking for more. Hirsch’s situation might not be the sort of thing that can be parlayed into a series, but there’s definite potential there. The character and Disher’s narrative approach, which limits things to what you can see through his eyes have definite possibilities.